What Day Of The Week Is June 26? 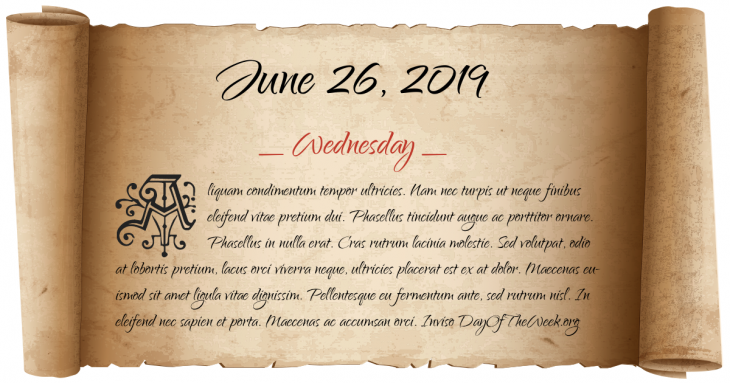 June 26, 2019 is the 177th day of the year 2019 in the Gregorian calendar. There are 188 days remaining until the end of the year. The day of the week is Wednesday. Francisco Pizarro is assassinated in Lima by the son of his former companion and later antagonist, Diego Almagro the younger. Almagro is later caught and executed. Tsarevich Alexei Petrovich of Russia, Peter the Great’s son, mysteriously dies after being sentenced to death by his father for plotting against him. World War I, Western Front: Battle for Belleau Wood – Allied Forces under John J. Pershing and James Harbord defeat Imperial German Forces under Wilhelm, German Crown Prince. Lavrentiy Beria,head of MVD, is arrested by Nikita Khrushchev and other members of the Politburo. Who were born on June 26?